2013 has been a big year for Sydney, Australia’s Electronic infused metal outfit, Dawn Heist. It has seen them rack up numerous successful national tours in their home country, as well as supporting the Agonist and Threat Signal on their recent European tour, an appearance at Euroblast and being signed to German based record label Bastardised Recordings for the release of their concept debut album Catalyst. The band embraces a heavy electronic influence in their sound to accompany their djent inspired riffing and this influence is there for all to see right from the outset on the opening track ‘Ascension’.Electronic soundscapes are the main focus of this song and accompany the staticco riffing and interchanging brutal/melodic vocals perfectly. The highly melodic infused ‘Zenith’ continues on from where the previous track left off and carries a killer hook, whereas the djent influenced ‘Escaping the Corincopia’ may slow things down in terms of tempo, it certainly beefs things up in the heaviness stakes and the off-kilter ‘Synthetic Zion’ injects some urgency, that proves to be a nice change of pace to shake things up on the album. A concept album which focuses on reality in three different forms, it is clear that each track has been thoroughly thought out on Catalyst and is a very unique and interesting concept for the band to tackle. 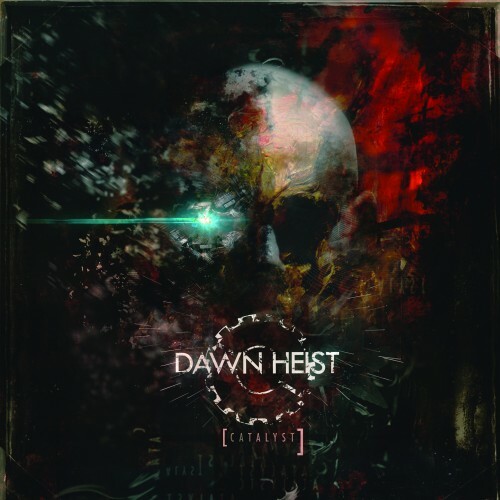 The key strength in Dawn Heist however, is their effective use of soundscapes and electronic music. The soundscapes created accompany each track to great effect and help enhance the overall feel they are trying to achieve with this concept for Catalyst. The dark, atmospheric ‘Reflections’ and the closing instrumental track ‘Prologue’ are perhaps the two greatest example of the bands effective use of electronic soundscapes. All signs point to a hugely impressive future Overall Catalyst is a focused and ambitious release. The album is certainly more of a ‘grower’ than an album that demands your attention immediately and those that can give it the attention that it requires, will be greatly rewarded with this release. Dawn Heist are perhaps still a work in progress in many areas, but all signs point to a hugely impressive future with this band, as long as they continue to evolve and carve out their own niche within the genre, to which Catalyst is certainly a promising beginning for the band.